For my tastes, anyway — and certainly the best job I ever had. 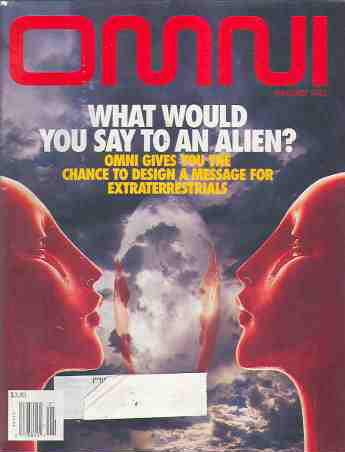 From 1990-1996 I was the Editor, and ultimately Editor-in-Chief of OMNI Magazine, the world's largest circulation science and science fiction magazine, which was as close to being a dream job as could be. Not that I had ever dreamed of having the job — but I had read the magazine from the moment the first issue appeared, and had even received a rejection-slip or two from OMNI over the years. Elsewhere I'll talk a little about my years at OMNI, as well as about the artists and graphic designers who played such a large part in the magazine's achievement, but for now I want to say some things about the people responsible for getting the writer's words on the magazine's pages (both paper and digital). I said when I was the Editor, and say now, that the best thing about OMNI, what made it such a special magazine, was the magazine's editorial staff. I've never known such a talented, ambitious, fiercely intelligent and articulate group of people, and it was my privilege to work with them every day. One of the finest fiction editors of our time, Ellen brought an acute eye and unfailingly impeccable taste to OMNI's fiction, acquiring great work from established writers and discovering great work from newcomers. As OMNI began moving online, Ellen thrived both in the digital environment and in the space it afforded for longer works than the magazine could contain. The OMNI NEON VISIONS series of novellas included some of the best long SF stories of the 90s. In the years since OMNI ceased regular publication, Ellen has not slowed down — it is in fact impossible for me to imagine Ellen ever slowing down. She's acquired fiction for a couple of OMNI's incarnations, for the much-missed Sci-Fiction, for Tor Books, and of course for her ever-expanding shelf of original anthologies and her indispensable annual Best Horror of the Year volumes. Widely (and rightly) seen as central to science fiction and horror over the past 35 or so years, I would argue that Ellen's editing is central over the same period to short fiction period. She is a figure to contend with in modern literature, not "just" modern fantastic literature. You simply cannot go wrong picking up a book or clicking on a story bearing the words "Edited by Ellen Datlow." An exceptional science writer and editor (and person! ), Pam was listed on the masthead as OMNI's Editor-at-Large, and as such she followed her instincts and skills in the development of numerous major features and feature-sequences that attracted attention and admiration in our pages — and beyond them. And not just features: Pam oversaw the creation of Planit: The OMNI Evolution Game, a board game included in our October, 1991 issue. When Bob Guccione became fascinated (to say the least!) with UFOs and alleged government coverups, and requested extended coverage of them in the magazine, I called on Pam to oversee our Project Open Book and make sure that the various features, short pieces, and columns were as skeptical scientifically scrupulous as possible. Our conversations during the course of the series were a constant delight, even when the topic was driving us crazy. After I departed OMNI in 1996, Pam took the helm of OMNI Online and (ditto no surprise) proved as gifted at this as everything she's done. Post-OMNI, Pam oversaw the creation and all-too-brief life of Event Horizon (Ellen Datlow was fiction editor), and in the years since has provided her special brand of insight and editorial guidance to various publications, all while maintaining a remarkably productive writing career. She is one of our most recognized — and most vocal — experts on Lyme Disease. In 2017 she brought OMNI back for one (so far) lovely issue. Over the last few years, as senior editor for AEON, Pam has acquired and edited a staggering variety of articles and essays on an astonishing range of subjects. I have long believed that Pam is one of the great, ambitious, demanding — and encouraging — nonfiction editors, and at AEON I got to have my knowledge confirmed first-hand: Pam was my editor on "Farming the Apocalypse," and not only made my work better with her requests and suggestions, but also showed me why her writers are so devoted to her. Lester Bangs called her "Kathi" during her days as a rock journalist, but at OMNI she was always Stein. Responsible for the OMNI Interviews — still the best and most in-depth series of science- and science-related interviews ever to appear in a magazine — Stein was also a sharp and incisive writer, particularly on neuroscience and related subjects. In fact, her title was Staff Writer, and I held that title over her head for years, imploring her to write more — and more. Like many good writers — and she was very good — Stein worked and worried at her pieces both obsessively and brilliantly. Her 2007 book, The Genius Engine remains the best introduction to the prefrontal cortex you'll find. I wish she had lived to write more books. But she didn't. As I wrote here, Kathleen Stein died unexpectedly in 2011. I miss her every day, and treasure every moment we spent together at OMNI and in the too-few years afterward. OMNI's angry (in all the very best sorts of ways) man, Murray worked — earned — his way up from an entry-level assistant's position at OMNI to Senior Editor, and at every level of responsibility brought a vibrant and ferocious commitment to bear on making things better — in the world as well as on the page — to his work. His outrage at our species' tragic and ongoing political and cultural violences and bigotries was tempered by a deep black humor that never (quite) became bleak. Murray was as fine a conversationalist as I've ever known. He was a wonderful writer as well as editor, and his final piece, "Notes From the New Land," a look at the Monroe Institute, is both first-rate journalism and also a philosophical quest, an account of man asking ultimate questions while facing those same questions himself. It reads as well today as it did when first published. Murray's death in 1994 touched the staff — and countless others — deeply. He had grown close to my family, and left his car to my son Alec. Appropriately enough, what became Alec's first car was eccentric, reliable, occasionally temperamental, always ready to go. No wonder Alec named it "Murray." As Associate Editor (and, later, West Coast Editor), Beth brought both a careful and skilled editorial eye to the pieces she acquired and edited, and also a deep interest concern for the environment and our effects upon it, enriching the magazine's coverage of those areas in the early 90s. She had an unerring ability to find the best shape for a feature — and to show occasionally recalcitrant writers the best ways to make their work better. Since OMNI, Beth has built a substantial and important career as medical and health writer. Keep an eye out for the byline "By Beth Howard" — you're guaranteed to learn something when you read her work, and it's an equally sure bet you'll enjoy yourself while you do. Responsible for the magazine's popular Continuum and Anti-matter sections, as well as numerous features, Associate Editor Erin Murphy possessed a rare gift — the ability to shape a scientific story into a complete piece in a couple of hundred words, or less. Not easy — try it sometime — even though the unflappable Erin made it seem so. Erin left editorial work when OMNI ceased publication, and while she has thrived in other fields, her departure for other fields remains publishing's loss. Managing Editor in 1990 and 1991, Phil made sure the magazine met all editorial and production deadlines, juggling all the details and complexities that go into the physical production of a monthly magazine, and never dropping a ball. His writing career since OMNI has been primarily focused on aviation, but when Phil took to the seas for his 2008 book Hemingway's Hurricane: The Great Florida Keys Storm of 1935, he made a large contribution to Hemingway scholarship — and to accounts of government mismanagement of natural disasters. Kellee wore many hats — and many titles — at OMNI both in New York and Greensboro, and wore them well. An organizational marvel, she always knew where everything was — or needed to be, an ability that has served her well in her career since leaving OMNI and publishing. Assistant Managing Editor Ben Spier possessed what remains the sharpest copy-edit and proofreader's eye I have ever experienced. Nothing got by Ben, however many of the other editors (myself definitely included!) an error or typo or misused word had evaded. Watching Ben concentrate was like watching a Grand Master make the moves that would lead inexorably to checkmate. Managing Editor from 1991 until the magazine ceased publication in 1996, Caroline coordinated the occasionally difficult production communications between the magazine's editorial headquarters in Greensboro and production in New York. She did an expert job, as she had earlier when handling often complex features and product-databases for the COMPUTE! family of magazines. Another COMPUTE! alumnus, Denny proved a natural at the move from close-focus computer journalism to the wider world of science and general journalism. As good as his computer magazine work was — and it was quite good — the broader consumer magazine venues OMNI offered were clearly those to which his talents were most perfectly suited, and I wish that OMNI had lasted long enough for Denny to have put his distinctive imprint on more than a few issues. Over the course of the last two decades of my freelance career, faced with the need for some piece of information or a bit of help with the arrangement of deadlines, I've been known to mutter "I need a Lisa Casinger!" It was Lisa who worked as editorial assistant, traffic cop, schedule coordinator, researcher, organizer par excellence, and anything else that needed to be done and done right. Early on it became obvious that Lisa's talents included writing, and she has developed those talents into an impressively long and successful career in trade and industry journalism. On the masthead as part of General Media's management and administration, Bill retained an editor's appreciation of the many challenges a magazine — and online presence — faced in addition to and beyond business and finance. In this he was unlike most publishing "management types" I've known, and OMNI, our online ventures, and the COMPUTE! family of magazines and books were the better for it. Having traveled to many of the world's great cities with Bill, I could always tell that the editor-side of him was undiminished: after hours Bill and I visited museums, libraries, historic sites (and, honesty compels me to admit, a few pubs and bars), always talking about history, ideas, culture and science. A fine traveling companion, and a man who played an important part in OMNI staying alive as long as it did. My first issue, November 1990. My final print issue. Winter 1995-1996. Click the covers to learn more about each issue.